Hatteras is complete, I decided on my sizing between the sky and the water, and I really should, at a minimum, be adding sky to the boats on top of the water, since that's the easiest measurement. But noooooo, what am I doing in the bottom right? Randomly slicing into a Dream On charm pack that has no place, whatsoever, on my project list. I think I have quilting ADD. The top row, the triangles are 2" apart; second row, 1.5"; third row, 1". I think I like 1.5" the best. But seriously, I'm not going to cut the purple sashing until I've put sky on those boats. And quilted Bad Romance. 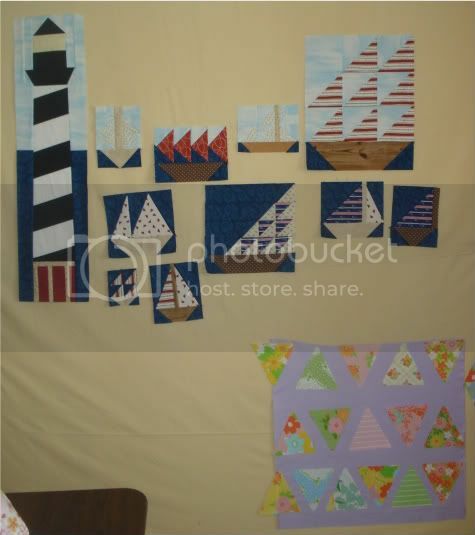 And caught up on the Layer Cake Quilt Along. Seriously. Check out Patchwork Times and see if other people have more focus. Sigh.